We're scratching our heads at the results of the latest episode of BBC's "Pitch Battle." 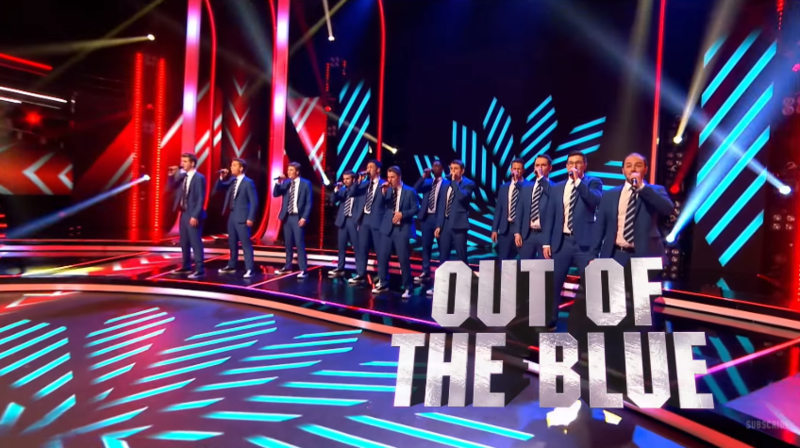 In episode two of BBC's newest singing contest, the boys of Out of the Blue from Oxford University finally made their debut appearance. From their bit in the opening number where the group performed Justin Timberlake's "Can't Stop This Feeling" it became quite evident that their vocal chops were leaps and bounds among other groups. Not only was their sound one of the most refined and polished in the nearly three minute opener, but there vocal parts were easily the most exciting to listen to with the various layers mixing group harmonies with well-orchestrated backing lines. Then came the group's moment to shine in the individual performance round where they covered Ricky Martin's "Livin' La Vida Loca." Not only did the group display some flashy choreography and killer pipes by multiple standout leads, but they were far and away one of the most entertaining groups to simply watch out of the six who performed. It was unfortunate that both the judges and audience seemed not as enthusiastic as the they did with some of the other groups. Out of the Blue then went on to the Riff Off Battles portion of the show where they competed against the group who would ultimately go on to win that night's competition, Scot Soul. There's no question that Scot Soul has some magnificent lead singers, and they displayed a few antics that showed us their personality during their multiple sets. But when it comes down to it, Out of the Blue easily deserved a bid to the next round, no group came close to bringing the diversity and talent that they brought to the show. And no we're not just saying this because they're an a cappella group. Don't believe us, check out their YouTube channel here. See the group's performance of "Livin' La Vida Loca" in the below video. Out of the Blue performs at the 1:43 mark.